RIGHT NOW, DAYS BEFORE THE WALK ON THIS SUNDAY APRIL 28, WE HAVE VERY FEW DONATIONS. I know so many of you have given in previous years but please don’t stop now. This disease has not gone away and there is much more to be done. Our daughter struggles with MS every day. It does not have to be a big donation. If you cannot make the walk please help by placing a donation in the mailbox of Howard and Shelly Wichansky at 97 Kings Mill Road or Dan and Bibi Levine at 34 Troon Court. Please make checks payable to the National MS Society- NJ Metro Chapter. The MS Walk 2019 will take place at the Monmouth Battlefield State Park,16 Highway 33, Manalapan on Sunday, April 28. The event opens at 9:00 AM for registration (indicate our team on your submission), handing in your donations and gathering for our “Team Bright Future” photo op before the actual walk starts at 10:00AM. Hope you can join us but time is now for a contribution that is so important. A big thank you to those who have donated in the past. Please help the MS cause this year. In the interest of trying to save a few dollars I am looking to put a group together for those looking to have their driveway sealed. Your driveway should be sealed every few years to avoid water getting into the cracks and creating major problems. I have spoken with All American Asphalt, a vendor on the Regency recommended list, and was told the discounted price for Regency residents is $85. This price will be reduced for a group. I also spoke to another vendor on the list and their price was $145 and would be reduced 15% for a group. If you want to have your driveway sealed for a group price please send me an email at artathome13@aol.com. them to attend our May Board Meeting to present their request. on Wednesday, May 1st. We look forward to a wonderful day. husband, partner, Dad are our guests. your complete table of 10/12. I have received some calls and emails regarding someone sending out emails asking residents to join “NEXTDOOR KINGS MILL” (emailing). In checking the internet for what I have written in bold, my suggestion, DELETE IT IMMEDIATELY if you receive an email and rip it up if you receive a letter. It definitely is “bogus”. One resident, Lynne Katz, received a letter saying she was in charge. She called and said she definitely is not in charge. MONROE TOWNSHIP – OLGA (SKIRKA) MESHOWSKI passed away on Wednesday, April 17, 2019, at Princeton Medical Center, Plainsboro. She was 86. Born in Manhattan, NY, she resided in Bayonne throughout her youth, graduated from Bayonne High School and attended Pace University, where she received an Associate’s Degree in Business and Marketing. She remained in Bayonne during the start of her marriage and relocated to East Brunswick to raise her family. Olga moved to Monroe Township 17 years ago with her husband, Frank. Olga met her loving husband, Frank, when she was just 17 they were married when she was 19. At 20, she gave birth to their first child. They celebrated their 67th wedding anniversary in January. She was a member and co-chairman of the “Ladies Who Lunch” Gourmet group, a past President of the Bayonne PTA, a past President and the oldest member of the East Brunswick Women’s Club. Olga was involved in any activity her children were involved in. With her husband, Frank, Olga was an avid golfer and enjoyed traveling around the world to different golf courses. She belonged to a book club in East Brunswick for over 30 years and loved to read most anything. But her main hobby and passion was gourmet cooking and entertaining. Olga was predeceased by her son, David, in 2005. Surviving are her husband of 67 years, Frank Meshowski; her two daughters, Elaine Melone of Spotswood, and Laurie Lang of East Brunswick; her sister, Maryann Kosiba, and her husband, Tom, of Shipbottom, and four grandchildren; Kristie Jankowski and her husband, Brian, Marissa Lang, Nicholas Melone and Katherine Meshowski. A Mass of Christian Burial will be held on Monday, April 22, at 10:00 AM in Nativity of Our Lord Byzantine Church, East Brunswick, under the direction of The BRUNSWICK MEMORIAL HOME, 454 Cranbury Road, East Brunswick. Interment will follow at Holy Cross Burial Park, South Brunswick. Friends may call at the funeral home on Saturday, April 20, from 3:00-7:00 PM. For directions, please visit our “Services” page. Memorial Contributions may be made to The Alzheimer’s Association, 425 Eagle Rock Ave, #203, Roseland, NJ 08068 or at www.alznj.org. This film received the Palme d’Ore which is the highest honor at the Cannes Film festival in 2018. The Shoplifters is a Japanese family drama depicting theirs struggles to keep every family member together. They are affectionate and dysfunctional, with their main source of income being petty thievery. One day they spot a 5 year old girl, Yuri, who is locked out of her apartment and freezing. They take her to their home where they find burn marks on her arms and decide to bring her into their family even though they have little for themselves. Eventually things go very wrong. 2 hr. Paid up members may bring a spouse or guest. We are looking for an individual who can put together a team of six men who can compete in both the Mayor’s Cup and Senior Condo Olympic events. If you are interested. The upcoming events are scheduled for the following dates, Senior Condo Olympics May 22 6:00 PM at Regency, Mayor’s Cup August 1 2:00 PM at Monroe 33 Sports Center. The Men’s Club has acquired tickets to 2 of the Senior Programs sponsored by the Garden State Arts Foundation at PNC Bank Arts Center located at Exit 116 on the Garden State Parkway, Holmdel, NJ. 2. June 14, at 7:30 p.m. — Cousin Brucie Presents Tommy James and The Shondells, Darline Love, and The Ventures on their 60th Anniversary Tour. If you are interested in obtaining the tickets, please call Roger Wood between 2:00 and 4:00 p.m. Monday through Friday at 732-605-7022. If there is no answer, please leave your name, address, phone number, and your choice of show(s) on the answering machine. Tickets will be distributed before the shows. 1. During my 3 1/2 months in Florida I was only able to fish the reefs once. We scheduled 4 trips and three were cancelled because of high winds with 8′ seas. So I fished the pond behind my building for large mouth bass, crappies and sunnies with great success. An update: During the last month the Striped Bass are in, big time! Feed back from the Captains, Al Restori and friends. This is the best spring run in over 30 years and the fish are large with some running upwards of 40lbs. The best part is that the fish are being caught on the Raritan River from about Ambrose Light west to about Chapel Hill Channel. This week four friends fished out of Great Kills Harbor on Pete Palurmo’s boat. Twenty minutes from the dock they were trolling up big Bass on MoJos. In about one and a half hours they boated 10 Bass and kept 4, the limit is one per man, and returned to the dock by 9:30 am. They were releasing fish that were 43″ to 48″ because they were females ready to drop their eggs. Friday, 5 men fished on Stan Salinski’s boat and trolled MoJo’s again with fabulous results. They caught their limit within the first two hours and continued to catch and release for the rest of the day. Bill Horne fished on a charter boat this week and they also had a very successful day jigging rubber shads. Would like to get out this week if the weather cooperates. Those interested please call me or email me. All single residents are welcome! Membership applications are available at the Clubhouse; membership is $30, annually. We meet the first Wednesday of each month at the Tennis Pavilion, unless otherwise notified. For additional information you can contact Dorothy Thomas 732-521-5063. 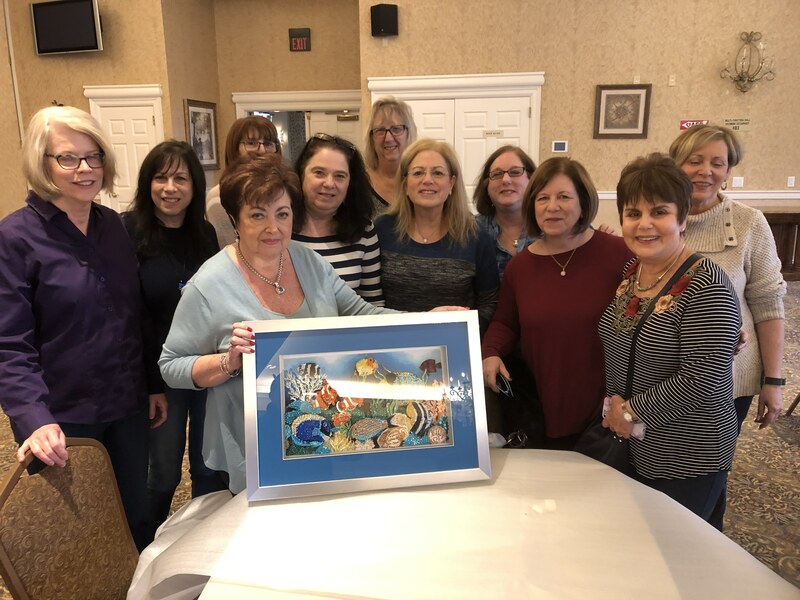 The Regency 3D Art class is proud to announce our first 3D Art Showing in the downstairs card room at the clubhouse on Thursday, May 16th from noon-2:00. Light refreshments will be served for the unveiling for our 3D art pieces. The artwork will be on display for about one month downstairs — in case anyone is interested but cannot make the showing. Attached is the photo of the 3D artwork by Joanne Rifflard (center) who is now taking her piece on tour in NC. If the photo is of interest, I can get you the names of everyone. Thank you and we hope you can stop by. Regency Hadassah is approaching our Ad Journal close out date of May 6th as we get ready to go to print. One Hundred percent of all donations will be ear marked for Hadassah Hospital Pediatric Cardiology. Ad prices are: full page $100, half page $50, quarter page $25 and booster $10. If you are interested in supporting this worthwhile endeavor please drop off ad text and your check at Karen Calder 183 Tournament or Nina Wolff 10 Monterey. REMINDER- HOLD THE DATE FOR OUR FASHION SHOW ON JUNE 17, 2019. I have 2 file cabinets that we are no longer using. This month’s Consumer Reports cover page and featured article is about robocalls. If you get the magazine, you have already seen the article which includes the opportunity to sign a petition online. This is one email I hope will circulate to millions of people to help rid the world of these calls. Does anyone have a portable commode and ramp for one day. They are nine hole events and there will be 5 ladies on a team. We are looking forward to another successful season. If there are any questions about these events please call me. I have been designated as the Class of 1964 class marshal, to be the main point of contact for our 55th reunion., Bob Schiffer, Barry Ancona, Howard Rotterdam, Mark Saidens, and Roger Levine will be helping me. The Alumni Association (https://www.stuyalumni.org/events) has decided Saturday, June 22 will be the “official” reunion day for all classes. They also will have a Fall reunion day, but haven’t told us when this will be. We are more than welcome to have our Class of ’64 events whenever we want. So, very shortly, we will be sending you a survey to assess interest in potential dates and activities and to help plan a reunion that best meets our desires. Stay tuned. We are concerned that our email list is outdated. If you have email addresses for other members of our class, please send them to me. Same request if you have a more preferred email address. We will meet next month on April 24 at 1:30 in the clubhouse lobby. We create items for charity and donate them to those in need. Everyone is welcome to attend. Questions? Contact Joan Kahn at joaniek22@verizon.net or 732-521-8381.
from 1-5 each day with some flexibility for additional hours as needed. Location is in Monroe Township off of Union Valley Rd. near the Ponds. Must have car. Starting early May. Offering a full size bed yours for the asking. The 2019 competition is soon arriving. Get your photos ready. Submit no later than April 12th, see below. You are all welcome to be at the competition being held this year at Stonebridge. You can attend even if you don’t submit. There will be refreshments. · Contest Date: Monday, April 29, 2019. · Location: Stonebridge 55+ Community 1 Cobblestone Blvd, Monroe Township, NJ 08831. Please enter from the main gate located on Federal Road. The guard house will be informed to expect attendees from member communities. Proceed to clubhouse. · Theme: Open, no specific theme/topic. · Color: Images may be color or mono. All images will be judged together ie. no separate category for color and mono. · Image Type: Digital only, no prints. o Images must have been created (taken by the camera) after May 1, 2017. Images submitted to previous competitions are not allowed. · Categories: There will be two ( 2 ) categories…..Beginner and Advanced. Each club will determine how their members are categorized. · Judge: To be determined. In the judging process, it will be left to the discretion of the judge whether or not to preview all the images prior to the beginning of the actual judging process at the competition. · Awards: There will be a 1st, 2nd and 3rd place ribbon awarded in each category ( ie Beginner and Advanced ). Additionally, a plaque will be presented to the club with the highest average score. HUNGER IS NOT A GAME – WE DESPERATELY NEED YOUR HELP! It is the goal of the Culture Club to collect a minimum of 4 cans or dry packaged goods from each household in Regency. If every household contributes, the pantry will be stocked for six months. Many township residents are struggling In this difficult economic climate. There are less donations being made to the Pantry when it is not holiday time, making it a little harder to provide necessities. These families are fighting to keep their heads above water. Please throw them a lifeline. Canned goods and dry packaged goods will help keep them afloat. Donations may be dropped at the Clubhouse Parking lot (pool side) on Saturday May 4 between 9:30am and 11:30am. Your support and generosity is appreciated by the organizers and welcomed and truly needed by the recipients. Please check dates on all items..the Food Pantry cannot accept any outdated products.If you are an owner of a company and you would like to contribute in volume please contact me. THE REGENCY AT MONROE BRONX CLUB WILL HOLD ITS ANNUAL PAID UP BREAKFAST SUNDAY APRIL 28 2019 AT 10AM IN BALLROOM THREE OF THE SOCIAL HALL. DUES ARE $30PP $15 IF SINGLE ALL CHECKS MUST BE IN BY MARCH 30 2019. HOT BREAKFAST AND ENTERTAINMENT TO BE PROVIDED. ON JUNE 23 2019 WE WILL BE GOING TO SAMMYS ROUMANIAN FOR SOME JEWISH SOUL FOOD COST IS $79 PP INCLUDES DINNER ENTERTAINMENT, BUS, TIPS AND GRATUITIES, THOSE OF YOU WHO HAVE GIVEN A DEPOSIT OF $54 PLEASE SEND IN YOUR CHECK FOR $25 FOR THE BUS. THOSE OF YOU WHO HAVE RSVP AND NOT PAID PLEASE SEND IN YOUR CHECK BY APRIL.30 FOR $79PP WE HAVE SOLD HALF THE BUS OUT SO DO NOT WASTE TIME AFTER APRIL 30 WE WILL OPEN THIS TRIP TO NON MEMBERS. our tentative calendar; March to September. that are taking place before and afterward. Dues are $30/year September to August. Doris Silverberg Levi for their participation in this event. Elin Hilderbrand has a long list of books including “The Perfect Couple, The Identicals”, “The Castaways”, “Winter in Paradise, “The Beach Club”, “Summer People”, etc. She is fondly referred to as the Queen of the Summer Novels. Cost: $70. per person. Checks made payable to Regency Hadassah should be dropped off to Leslie Kohn’s mailbox- 82 Country Club Drive. One check per person please. Completed tables should be listed on back of form and all checks enclosed in one envelope. For small parties, we will be happy to put a table together for you. NO REFUNDS. THIS EVENT IS NOW OPEN TO ALL FOR SIGN UP. BRING YOUR FRIENDS! Lunch will include fresh salmon, fresh tuna, fresh chicken, salads, side dishes and dessert. The Regency Choral group meets every Monday from April-November from 4:45-6:00 in the clubhouse. If you’re interested in joining please call Sharon Scheckner at 732 656 3165. All are welcome ! Monday afternoon, June 24h, at 4:00 pm the Men’s Club will travel to Philly to see the Mets vs .Philly game. Travel is by luxury bus. We will sit in section 208. Total cost $45 includes admission ticket and bus. Checks to the Regency Men’s Club can be placed in Allen Glassman’s letterbox at 83 Riviera Drive. This is a one year anniversary for Regency Club Harmony In Motion! During our first year Harmony In Motion had six successful events. We look forward to another successful year of Regency Club Harmony In Motion. We remind everyone to fill out their membership applications for 2018-2019 to join in the fun! Membership dues are $5.00 per person or $10.00 per couple. The Regency Men’s Book Club will be meeting at the Clubhouse on the first Wednesday of the month at 4:00pm. All men are welcome. Please call Lou Flumen at 732-641-2495 if you are interested in joining or if you have any questions. A class of Jewish ethics, values and traits of character. This class, led by Rabbi Louis Stein, will be meeting every Thursday from 10:30 to 11:30 in the fitness room. A different topic will be explored each week. Class will begin again in May 2019. We play duplicate bridge at the clubhouse every Tuesday evening. These games are sanctioned by the American Contract Bridge League (ACBL) and we award internationally recognized Master points to many of the players each week. We play a social game and welcome players of all skill levels who wish to expand their bridge capabilities. Our games begin at 7:00 PM sharp – but if you want to come, please be at the back ballroom by about 6:45 to allow for checking in. We have the most reasonably priced game around and we include snacks and soft drinks too.